To promote student success by supporting the work of local school districts, delivering specialized student services, and providing countywide leadership and advocacy for the needs of all children. 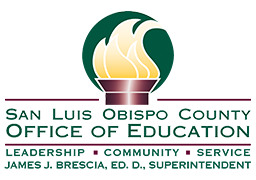 San Luis Obispo County will be an educational community dedicated to preparing all children and youth for responsible citizenship, meaningful work, and lifelong learning. Support for Districts – Our County has over 34,000 students enrolled in over 75 schools in the 10 school districts in the county. Our schools stretch from Nipomo to Parkfield and from the Lucia Mar Unified School District with over 10,000 students to the Pleasant Valley Joint Union Elementary School District with 125 students. The County Office of Education provides academic and financial support and assistance regardless of district size. We serve as a source of information and we provide a variety of professional development and training opportunities for both the teaching and non-teaching staff in the county. We also provide assistance to all districts to maintain fiscal solvency and have statutory authority to exercise fiscal oversight for districts. Countywide Leadership and Advocacy – Our office serves as a focal point for community education about our schools. We are able to provide a county-wide perspective on educational issues that might arise locally or at the state and national level. Our office is also in a position to mobilize local interests on behalf of providing a quality education for all students.